One girl's adventures into a world unknown, facing danger and eyelash curlers head on. In short, yes. It really is. I know that we all want the new Urban Decay palette, but who can justify the price tag these days? We have bills to pay, groceries to buy and hey look! The site from China has the EXACT same pallet for $10. Bargain! But is it? 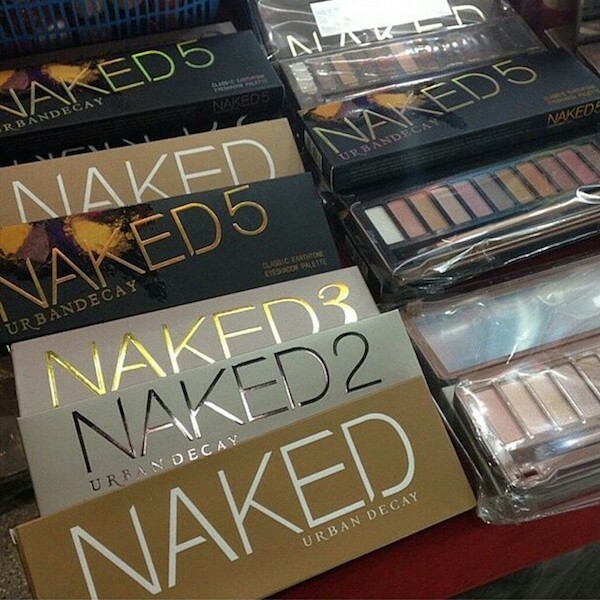 What’s the real difference between a real UD Naked palette and the cheap one on Ebay? Well, the main difference is quality. Some may be straight up rubbish with minimal colour pay off, but we have seen those “amazing” dupes people find that are insanely pigmented, so they are ok right? Sorry, nope. When I say quality, what I actually mean is quality of the manufacturer. UD and all other “proper” brands face really strict rules and regulations imposed by each government in each country they distribute in. This covers using ingredients that are deemed safe to be used on the skin, being created in environments that are sanitary and after jumping through all those hoops, once they have finalised the product itself, they then have to have the batches of product tested again. This is why you know when you buy an authentic brand that you can trust it won’t give you an eye infection, that it won’t lead to blindness, that it won’t cause so many of the issues you can face when buying fakes. Still shaking your head thinking, “Yeah, yeah, whatever you reckon. It’s not that bad – I’VE never had a problem with anything I’ve purchased.” Then consider yourself lucky. Every time you purchased from these factories pumping out “duplicate” palettes you’ve played roulette with your health. Go right ahead and google what has happened to people who haven’t been as lucky. No really, go now. I’ll wait. Yep. Pretty gruesome stuff hey? Is it really worth the gamble? Would you pick up a lipstick from a trashcan and put it straight on your lips? Didn’t think so. And why? Because you don’t know where it came from and who has been touching it? BINGO! The moral of the story here is just don’t. Don’t play with your health, don’t risk your eyesight and don’t feel like you are a lesser person because you can’t afford the real palette right now. There are plenty of other options on the market that won’t give you pinkeye. And while we are at it, let’s talk more about the conditions that they make these duplicate palettes in and what you’re actually getting for your bargain price. Well, when you expect more bang for your buck, did you mean 46 times the permitted level of copper in a fake MAC eyeliner? Just think about that for a second – it’s going near your eyeball. Your eyeball! The Daily Mail in the UK purchased 10 items of designer makeup online. 8 of them were found to be fake and when they had it tested using the same methods that cosmetic companies normally need to have their products tested through in order to have it deemed safe, it was found to contain ingredients including lead, copper, mercury, arsenic and cadmium (which is extremely dangerous!). Dermatologists are reporting a rise in skin conditions triggered from using these fake products, anything from acne to swelling to psoriasis. Don’t even get me started on the unsanitary conditions these products are made in. Many tests have shown the human urine and rat droppings are common ingredients for these fakes. Let that sink in. The least harmful thing in these cheap products is someone’s wee and rat poo. And quality control? What quality control! The colours are rarely exact, the pigmentation rarely passable and honestly, you’re much better off just buying what’s in your price range from a reputable store. These products are also often made by criminal gangs, with your money supporting what they do, so that’s something else to think about. I know that many people only care about the price, but please do consider your health, consider the implications of what you are doing. Just think before you buy, ok? And if you are a professional makeup artist who does this (and I know you're out there!)? You should be so ashamed of yourself - you're not just putting yourself at risk but your clients who have absolutely no idea that you're putting that stuff on them. It's not on. And you should never call yourself a pro - you're a disgrace. Now, I bet some of you have agreed with what I’ve written but are still thinking that buying fake brushes etc are totally fine because you can clean them. How bad can it be? Stay tuned, because I’ll tell you in the next post. I am a fully qualified makeup artist who is internationally published, and I have worked with and been mentored by some of the very best in the business! Now I'm ready to share my tips and tricks, answer your questions and most importantly, help you make every makeup moment a memorable one. I'm makeup artist who managed to turn a passion for pretty into a career. I have a soft spot for designer glasses, nail polish and chocolate (but not necessarily in that order). I'll try anything at least once and believe it is better to fail spectacularly then to never try at all.